A brilliant combination of boost and EQ if you don't mind a slightly larger pedal. 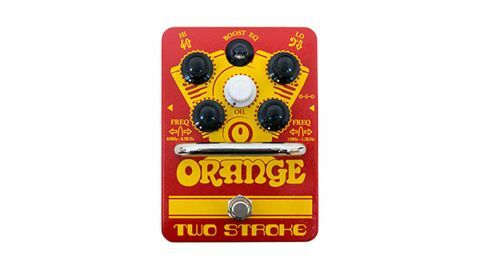 There is an abundance of boost pedals currently available, some of which have adjustable EQ, but the Orange Two Stroke goes further by combining boost with a powerful two-band parametric EQ. If you just need more of what you already have, then turning up the Oil knob will give you up to an extra 12dB of boost to kick the front end of your amp. But if there's a certain tonal area you'd like to cut or boost, you can get 18dB at a selected frequency from each of the Hi and Lo EQs. These are incredibly powerful either when used singly or in conjunction for tasks, such as reducing superfluous low-end flab, refocusing the midrange content or boosting the top end. While this is a pedal that can confidently deliver the mild boost and EQ shift you might need to kick in for a solo, it also comes with the capability for a more radical sonic sculpting that can organically transform your guitar/amp voice.